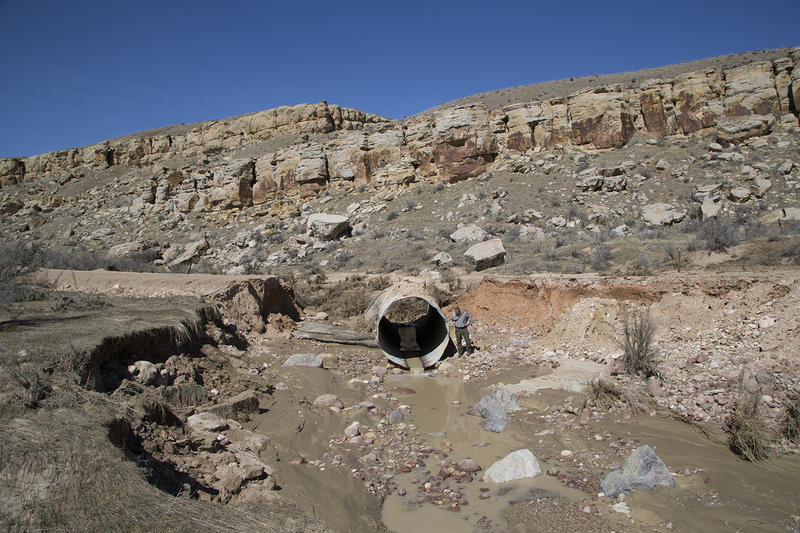 Dinosaur Monument staff and engineers from the Federal Highway Administration recently assessed the Island Park and Rainbow Park roads to determine the extent of the damage caused by flooding over the winter. The assessment was done to assist in determining immediate fixes that could allow the road to reopen and longer term solutions to prevent damage in future events. The roads experienced two significant events within six months that led to washouts. The roads are currently closed near the monument boundary. The Rainbow Park Campground and Boat Ramp are not accessible at this time due to the closure. All single-day river permits for the Split Mountain Canyon section of the Green River are on hold until road repairs are made and the road is reopened. This closure does not affect visitor access to the Quarry Visitor Center or the Quarry Exhibit Hall. The Island Park/Rainbow Park Road is a 13 mile unpaved road located on the monument’s northwest corner. The road provides access to the Rainbow Park Boat Ramp which is the launch point for single day rafting trips through Split Mountain Canyon. Also located in this area are the Rainbow Park Campground, McKee Spring Petroglyphs, and the remnants of the historic Ruple Ranch. Engineers are looking into a variety of options to initially open the road including using a temporary bridge. No information is available at this time on a potential reopening date. Updates will be provided as they become available. Photo of a portion of the washed out road. Click to enlarge. For more information, call (435) 781-7700. This entry was posted in News and tagged center, colorado, d, damage, dinosaur, Green River, Island Park, Moffat County, Monument, National, quarry, Rainbow Park, reopen, road, Split Mountain, unpaved, visitor, wash out, washed out, washout. Bookmark the permalink.